One of the reasons Samsung has come out of nowhere to ambush Apple in the global smartphone wars is that Samsung was the first company to popularise phones with big screens. Apple stuck to its small 3.5 inch screen for its iPhone 4 and 4S, and then only expanded to a 4-inch screen for the iPhone 5. Samsung, meanwhile, introduced a Galaxy SIII with a 4.8-inch screen and the Galaxy Note with a gigantic 5.5-inch screen. Lots of buyers loved the bigger screens. 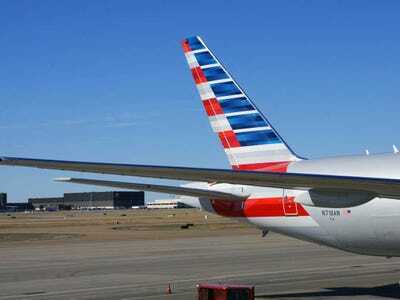 Including, it seems, American Airlines. Ron Miller of CITEWorld reports that Samsung beat out Apple and other smartphone vendors to win an American Airlines order for 17,000 phones for flight attendants. The phones won’t be for personal use: They’ll be company-issued phones that the flight attendants will use to provide better service. The Notes were fitted with Samsung’s “SAFE” (Samsung for Enterprise) software, which enables the company to manage them remotely. This is obviously only one enterprise deal, but it’s a notable win for Samsung. And the reasons that American selected Notes over iPhones fly in the face of several points that Apple defenders often make when arguing that the iPhone is clearly superior. Canada said AA tested a number of devices, starting in early spring 2012. “We reviewed iOS and other Android tablets and PDAs, in addition to proprietary devices from third party vendors that responded to the RFP. A proof of concept test was started in February 2012 and final device selection was made in September 2012,” she said. They chose the Galaxy Note (the original, not the more recent Note II) for a variety of reasons. “Our flight attendants felt that it was easy to handle and store, while providing great readability. The Galaxy Note also fits nicely in the palm of the hand, to allow easy mobility while moving about the aircraft. It also enabled us to make customisations to fit our needs,” Canada told me. – See more at: http://www.citeworld.com/mobile/21486/american-airlines-arms-flight-attendants-samsung-galaxy-notes#sthash.6MYi9UlX.dpuf Canada said AA tested a number of devices, starting in early spring 2012. “We reviewed iOS and other Android tablets and PDAs, in addition to proprietary devices from third party vendors that responded to the RFP. A proof of concept test was started in February 2012 and final device selection was made in September 2012,” she said.